A space elevator would physically connect the ground to the geostationary orbit. It could be used to move men and cargo at a very low energy cost. Space elevators have their defenders and detractors. What is certain is that they risk remaining in the field of science fiction for a long time. But that does not preclude already doing some research on them. This is the intention of a Japanese team from Shizuoka University. An H-2B rocket should take off in the hours or days ahead to take a Japanese cargo ship HTV to the international space station. It will contain an experience that strongly resembles a miniature space elevator. The concept is still relatively modest. Two 10 cm CubeSats will be deployed from the International Space Station. They will be interconnected by a 10 meter cable. 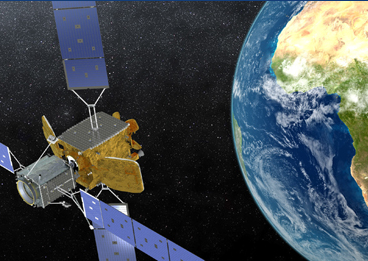 A small mobile cart will move from one satellite to another along this cable. It is a test on a very small scale but it is still the first fully functional elevator to be deployed in space. The experiment will be recorded using cameras placed on the CubeSats at both ends. It is above all a question of whether the behavior of a space elevator is in line with the predictions in microgravity. The concept of a space elevator seems to interest Japan a lot. In 2012, Obayashi Corporation announced plans to build a space elevator for the mid-century. In their vision, a cabin moving along a cable could carry about thirty people to the geostationary orbit in just over a week. Obayashi Corporation’s plans are more reminiscent of a dream than a realistic project. The construction of a space elevator still requires enormous progress. Carbon nanotubes are often referred to as the ideal material for building a space elevator, but millions of tons of nanotubes would be needed to make a space elevator. This does not prevent the Japanese from multiplying the space experiments with cables. In 2016, JAXA had attempted to deploy a 700-meter cable from the ISS and use it to deorbit space debris, but unfortunately the experiment could not be conducted properly. We hope that they will succeed with their mini space elevator. A space elevator is a physical structure that would connect the ground to the orbit and on which it would be possible to move. Many versions of this concept have been imagined by researchers and science fiction writers, as in Arthur C. Clarke’s novel “The Fountains of Paradise” which popularized the space elevator to the general public. A NASA research report on the space elevator was published in 1999. A space elevator, what is it for and to whom ? If we could build such a structure between the ground and the geostationary orbit, we could move there some lifts that could carry people, equipment or energy between the ground and the orbit. What makes this type of structure very attractive is that the trip would have a very low energy cost compared to the use of a rocket. This is the kind of technology that could lower the cost of access to space to about $ 10 per kilogram. In addition to its function of transfer between the ground and the geostationary orbit, one can find many functions related to a space elevator. It could for example stop in low orbit. However, the payloads left at this altitude should still provide an acceleration of a few kilometers per second by their own means to orbit themselves. Similarly, by extending the space elevator further than the geostationary orbit, it is possible to reach the speed of release of the Earth’s orbit and thus to put payloads on an interplanetary trajectory. Incidentally, the space elevator could serve as a giant communication relay capable of covering the needs of an entire hemisphere. The potential of the space elevator is enormous if we can build it one day. The tallest artificial structure is currently the Burj Khalifa Tower in Dubai, which rises to 830 meters. In theory, with the current materials and construction techniques it would be possible to realize works of several kilometers high. But the geostationary orbit is almost 36,000 kilometers above sea level. The space elevator is therefore a major engineering challenge. How to build a space elevator? To get there, there are two possibilities. One can either rely on a compressive structure, ie a tower maintained by its own weight. This is the approach that Constantin Tsiolkovsky envisioned when he imagined the space elevator. It was even the Eiffel Tower that inspired him. Or one can imagine a structure that relies on forces of tension between the ground and a counterweight placed beyond the geostationary orbit, like a rope that would remain tense due to the centrifugal effect. In the most recent designs, it is the second solution that is preferred, simply because the most resistant materials known have a much better resistance to tensile forces than compression forces. Take for example two of the most resistant materials today : if you want to build an epoxy tower, it will be able to support its own weight in compression up to a height of 122 kilometers. Conversely, if you suspend a plastic structure with carbon fiber reinforcement, it can support its own weight in tension up to a length of 373 km. In both cases, we always remain far from the necessary height. It could be interesting to combine the two approaches by building at the base of the elevator a 3000 km tower based on compression forces. It would then be possible to reduce the mass of the structure in tension by a factor of 150. But still important progress has to be made on the materials. 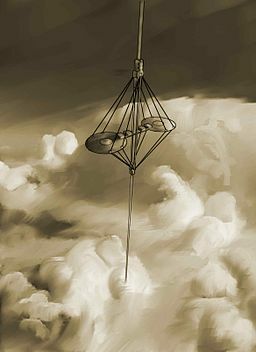 Ideally, the central structure of the space elevator should be as light as possible to limit the stress due to its own weight, and yet strong enough not to break under the incredible forces here : for example, in a space elevator whose structure is under tension with one side gravity pulling and the other the centrifugal effect related to the counterweight, this is like tug-of-war with a hundred thousand people in each team. A few years ago, the discovery of carbon nanotubes demonstrated that some materials may have the necessary strength to support a space elevator. But the production of carbon nanotubes is still very experimental and limited, and the space elevator is a huge structure requiring huge quantities of materials. Similarly, building the space elevator is only the beginning of the work : it must then be able to maintain it. A space elevator would be exposed to meteorological conditions in its lowest parts and to micro-meteorites and space debris in its uppermost parts. Even the smallest damages could endanger the integrity of the entire structure. In the event of a break-up, the fallout on regions below the space elevator would be catastrophic. How much does a space elevator cost? One of the important questions that determines the interest of a space elevator remains its economic profitability. The space elevator could lower the price of access to space at rates similar to those of civil aviation. But if we add the costs of manufacturing and maintenance, a space elevator would be an international project involving the economic efforts of many nations. Given the investment required, it would take many years of exploitation to make a space elevator profitable. The role of a space elevator is quite specific : in the most common designs, only the geostationary orbit is served efficiently. In low orbit, additional acceleration must be provided and the equatorial plane is far from optimal for interplanetary trajectories. Finally, if one was able to develop materials resistant enough to build a space elevator, then these same materials could be used to make rockets high-performance and reusable, further decreasing the interest of the space elevator. A lunar space elevator is a much more realistic project. 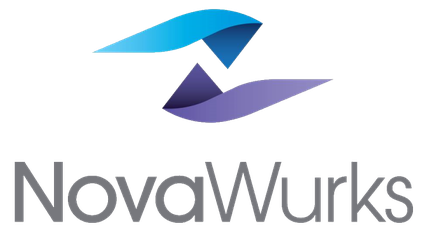 The reduced gravity of the moon would allow to build the elevator with materials already well mastered, kevlar for example. An elevator erected between the lunar surface and the L1 Lagrange point of the Earth-Moon system would be an effective method for extracting valuable lunar materials, for example for the construction of space habitats. We can also imagine much simpler space elevators, not between the ground and the orbit, but between different orbits. For example by placing their center of mass in low orbit part of the elevator would then hang just above the atmosphere at 150 km altitude. Thus, it could be joined by single-stage rockets of simple design. The payloads could then be released in low orbit or even on interplanetary trajectories since such a space elevator would not need to be on the equatorial plane. Space elevators are likely to remain science fiction for a long time. 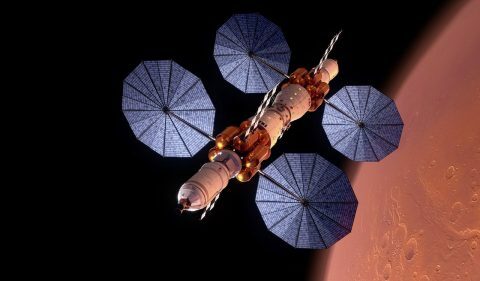 Even if the necessary materials are developed in the coming decades, it is unlikely that the economic interest will push a corporation or a state to build it, especially when the rockets finally seem to promise reducing the cost of access to space. If reuse holds its promise then it will probably be centuries before we talk again about the concept of a space elevator. 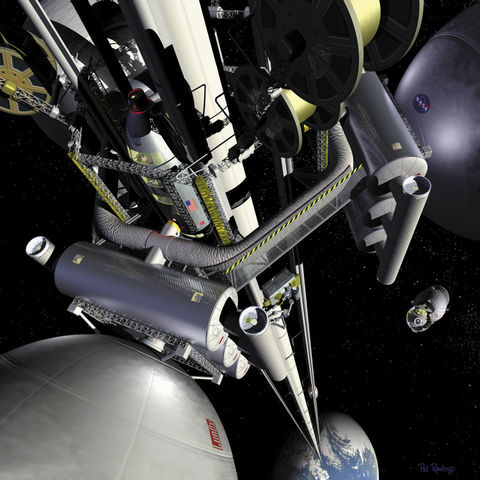 In the near future, other concepts that are close to the space elevator could be implemented. This is the case, for example, with captive propulsion, which uses two long cables to change the orbit of a payload at a lower cost.